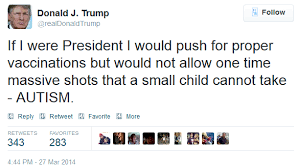 Latest Trump betrayal...Puts all of us in danger of mandatory vaccination. Before becoming President, Trump mouthed SO many things that were designed to trigger "hope" in well-read Americans. He made noises about being skeptical about some of the biggest lies and charades of our time as a "reality T.V. star" candidate for President two+ years ago. 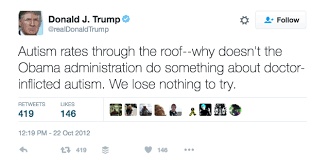 He was an early "birther," a known "climate-scare skeptic," very critical of the Iraq War (making even 911 truthers hopeful), and perhaps, most ardently of all...A VACCINE SKEPTIC. He was such an open advocate of vaccine choice and skepticism, that he promised to hold a major government-sponsored "vaccine summit" over the issue. Now, as with most of the things for which a suitable counter-charade could not be established (that did not risk immediate, easy, exposure) he is simply reneging. Let me just insert, right here, that I am a big supporter of the vast majority of Trump's stated positions. Unfortunately, those are so rarely turning into actual positive action, that we can no longer trust him to follow through on ANYTHING. 'I was very optimistic about it,' he said, adding that he initially was given 'high level meetings' with 'agencies' and presented a powerpoint detailing his group’s belief that vaccines were harmful to children. 'We left convinced the White House was going to follow up and then the White House went dark,' Kennedy said. This better not be a Democlan v. Republicrat problem!! This is far too important issue for partisanship. The American people deserve REAL HEARINGS on this issue, not the trumped-up, "teenage rebel," one-sided, vaccine-propaganda session Congress held recently and had the temerity to call "hearings"-- while locking out people from all over the country who tried to get in to present the other side. 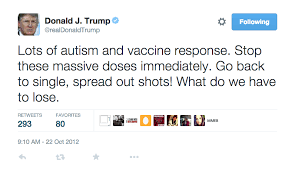 Since being elected president, however, Trump has largely avoided discussing the topic of vaccines at all." DID THEY GET TO YOU, DONALD? ?...or were you always simply playing to the masses from day one? By the time sufficient Trump lovers and Q believers realise that they have been duped it will be too late. Same happened with Obama. Hope and Change sounded great at the time but it didn't take long before his true colours came out (or more accurately before his handlers pulled their strings). I am getting tired of speaking out about vaccines and all the rest of the stuff I speak out about because it seems like people are becoming more brainwashed rather than less. How many lies does a person have to be told before they stop believing the liar? In the case of governments, presidents and prime ministers it appears that most people have little to no memory and prefer to allow government to look after them. "Sheople..." Best pejorative ever created. NEED TO BELIEVE. Yep. That, and estrogen/soy/GMO/fluoride/chemtrail-induced lethargy. I dunno, why don't you take your un-vaccinated family on a nice long extended vacation to New York where they have declared a state of emergency on Measles, depending on if your kid(s) survive or not you can come back and give us witness testimony on the experience.